Hives are red itchy bumps on the surface of the skin that can range in size from a very small spot to a large raised welt. The medical term for hives is urticaria and some people also refer to hives as nettle rash. The itchy patches caused by hives can affect your face, hands, as well as other areas of the body and they can be triggered by something that produces an allergic reaction – an allergen. 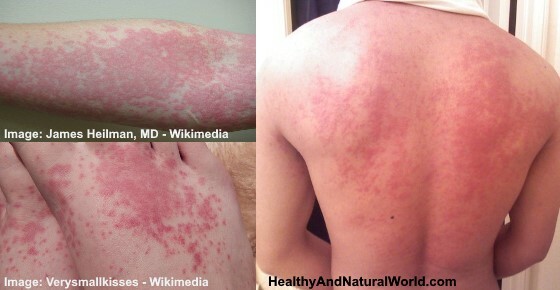 This article will help you find natural treatments for hives that will help you get rid of them. I am also going to mention natural ways to help you prevent outbreaks of hives. If you suffer from hives you know that it can be difficult to find exactly what triggers them. Especially for people who have chronic hives, the condition can affect daily activities and cause emotional stress. Let’s look at natural ways to treat hives (urticaria) and to relieve the itching that comes with the condition. Hives are usually caused by an allergic reaction in the body to food or medication. Dr. Jennifer Robinson on WebMD says that the most common causes of hives are foods like nuts, fish, chocolate, eggs, tomatoes, and milk. Also certain food additives can cause hives in some people. Alcohol and caffeine can also trigger hives.1 Medications that can cause hives include aspirin, ibuprofen, and some kinds of high blood pressure medication. If hives last for more than six weeks, it is classed as chronic urticaria and doctors say that it is very difficult to find the cause of this type of hives. Hives shouldn’t be confused with angioedema. This is also an allergic reaction but it causes swelling beneath the skin, not on the surface of the skin. It also causes itchiness like hives. There are many natural treatments for hives which can help to reduce the itchiness, relieve the swelling and, in some cases, prevent hives. Let’s look at the best natural ways to get rid of hives. The University of Maryland Medical Center says that when the body has an allergic reaction, it releases histamine into the blood. This results in itching, swelling, and redness, which is common in hives. Most doctors prescribe antihistamines to get rid of hives. While these can be effective in treating an occasional outbreak of hives, many people prefer to look for natural antihistamines for hives, especially chronic urticaria. To help reduce the outbreak of chronic hives, you can use quercetin supplements. This is because some foods, although high in quercetin, also have high levels of histamines and can make the allergy worse. Another herbal remedy to prevent and treat hives is stinging nettle (Urtica dioica). It seems a paradox that the stinging nettle causes hives (nettle rash) when it comes in contact with the skin. However, it has the opposite result when it’s ingested – it acts like an antihistamine. To use stinging nettle to treat hives and other allergic reactions, it is recommended to take 300 mg/day of freeze-dried stinging nettle. You can also make a nettle tea by putting 1 tsp. dried stinging nettle into a cup of boiling water (triple the amount if using fresh nettle), cover for 5 minutes, then drink. Alternatively, you can let the nettle tea cool down and then dab a cotton ball in the tea and apply to the hives for relief from the red itchy bumps on the surface of the skin. For more information read my article about the best natural antihistamines to fight allergic reactions. There are many essential oils which can help to reduce the itchiness caused by hives. To make a soothing chamomile application for hives, you can mix 5 drops of chamomile essential oil in a tablespoon of coconut oil or other carrier oil and apply to the skin to relieve the symptoms of hives. You can also make a soothing skin wash to help get a relief from hives. Combine 5 drops chamomile oil, 2 drops peppermint oil, 3 tablespoons baking soda and 2 cups of water in a bowl. Using a soft cloth, apply to the hives until the itching has reduced. If you don’t have chamomile essential oil, you can make some chamomile tea and use it as a natural remedy for hives. Put 1-2 tsp. dried chamomile into a cup of boiling water, cover the cup and let it infuse for 10 minutes. When the tea has cooled down, apply the tea using a cotton ball to the affected area to alleviate the itchiness caused by hives. Generally, essential oils should never be applied directly on the skin. However, you can use lavender oil directly on the skin on very small areas. Using a cotton swab, you can apply a small amount of lavender essential oil to soothe the itching caused by hives. For extra moisturization, or if you have a sensitive skin or use it for a larger area, mix a few drops of lavender essential oil with a tablespoon of a carrier oil like coconut oil, olive oil or jojoba oil and then massage into the affected area to relieve the itchiness of hives. You can also add lavender oil to a bath to treat itchy hives. You should mix a few drops of lavender oil per one tablespoon of a carrier oil and add to a warm bath. This will not only help you get a relief from the itchiness cause by hives, but will help you relax and reduce your stress levels, which can also be a cause of hives. Put 2 cups of ground oatmeal into a long tube sock or old pair of pantyhose and tie loosely. Draw a bath with tepid water making sure that the oatmeal sock is under the faucet. Every so often, squeeze the sock to get more of the oat liquid out. Soak in the tub and dab the oat sock onto the hives to get a relief from itching. Be careful coming out of the bath because the oatmeal liquid can make the bath slippery. For even better relief from itching caused by hives, you can add a few drops of lavender oil mixed with a carrier oil to the bath. To make a bath with baking soda for relief from itchy skin you should add about 1 cup of baking soda to a bath and soak for 20 minutes. Or you can make a baking soda paste to get rid of itchy hives. Mix enough water with 1 tbsp. baking soda to make a smooth paste. Apply to the hives to relieve the itch. Rinse off with cool water. One of the many uses of apple cider vinegar is to reduce itching on the skin. You can try using ACV to see if it will relieve itching caused by hives. You can mix equal amounts of raw unprocessed ACV and water and then apply to the affected areas using a cotton ball. For more information please read my article on why you should wash your face with apple cider vinegar. A cold compress gives instant relief from the itching caused by hives. You should put some ice in a bag and then wrap it in a towel. Put the ice pack on the hives for quick relief from the itchiness. Don’t leave the cold pack on for longer than 10 minutes at a time and remember never to put ice directly onto the skin. This remedy, however, won’t be effective for people whose hives are caused by extreme cold (a rare cause of hives). To prevent hives it’s important to know what triggers your symptoms. Because different types of medications can cause hives, you should speak to your doctor if you think that your hives are connected with your medication. Stress can affect your body in many ways, and is also a reason that hives appear. You can help make your hives go away by taking positive steps to reduce stress in your life. Some people find relief from hives by using aromatherapy, exercise, meditation or by practicing deep breathing techniques. 1. Hives and your skin. 2. Hives and angioedema: causes. 3. Chronic urticaria: a cutaneous manifestation of celiac disease. 5. Quercetin is more effective than cromolyn. 6. Natural treatment of perennial allergic rhinitis. 7. Anti-allergic activity of German chamomile. 8. Lavender oil inhibits immediate-type allergic reaction. 9. Hives and angioedema: lifestyle and home remedies. 11. J Drugs Dermatol. 2007 Feb;6(2):167-70.